Goal Met! – Tamara Shazam! And if I were a bare minimum kind of girl, I would be done about now. Ha ha! But I’m not. I have to tell you WHY I haven’t been running or posting. It’s because I’ve been so incredibly overwhelmed by life and, as a result, so freaking exhausted. Like, when you’re trying to stay up past nine o clock so hard but can’t, so you fake wake up over and over and act like you’re watching the movie by saying such observant things like, “Wow, look at that!” Or engaging in pseudo conversation like, “Do you think this move is good and why?” Before smugly laying my head back down, eyes drooping, convinced that Bradley has no idea that I’m actually dozing between statements. The next morning I hear about my snoring, though, and about my gibberish sentences or how I pick up conversations from dreams and bring them to him, live, in the real world, saying some embarrassing nonsense before I laugh, wilt then snore again. Yup, I’m reaaaal smooth. I was thinking about my winter break and how I want to approach it, food-wise and exercise-wise. I think it’s reasonable to expect myself to run ten miles each week. That lower mileage will help me get back up to speed. I’m still maintaining my fitness, but my lungs burned today and my heart felt flumpy. I need to get back into real shape again. It won’t take long, but I need to give myself some latitude. As far as food goes, I think I’ll stick with my usual diet. I always allow myself a cookie or treat if I want one on days where I’ve worked out. This month I’ll just have to be super careful about sticking to that rule. And like Thanksgiving, I’ll let myself take Christmas off. Though, remember how I hit 213 on thanksgiving and wouldn’t let myself lose my footing? Wouldn’t that be funny if I woke up less than 210 on Christmas morning? I’d take that gift over cookies any day! 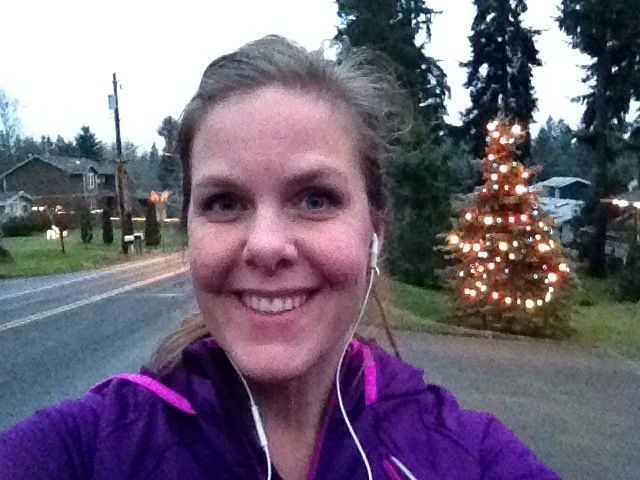 So there’s the goals: 20 miles and the same calories except on Christmas. This week I hope to run a few more times and stick with my food plan.